So Microsoft is running a new promotion. It's called the "Halo 4 Combat Tour," and its purpose is to encourage you to play lots of Halo and buy lots of Halo-related things. "The more you do, the more you get," Microsoft says. They'll give you Microsoft Points—Xbox Live's confusing digital currency—if you play an excessive amount of Halo 4 during the month of November. In real money, 800 Microsoft points is $10, and 600 would be something like $7.50. 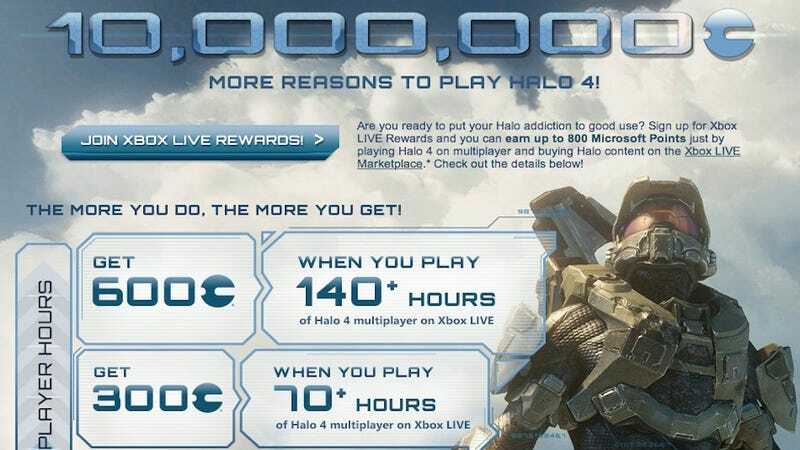 So if you play 140+ hours of Halo 4 in November—that is, roughly six hours a day for the next 24 days—you'll earn $7.50. Seven dollars and fifty cents. If you play this game online for 140 hours out of the 576 hours between November 6, Halo 4's release date, and the end of November, you will win yourself $7.50. If you spend 24% of the month playing Halo 4 online, Microsoft will reward you with seven dollars and fifty cents. You know, Microsoft, between this and the $0.25 birthday giveaways, it's starting to feel like you guys don't quite get it.